Kolte Patil Downtown – Too good to be true! Almost dream-like magical! Kolte Patil developers have set their eyes to bring out the best that modern aspirants for a global and carefree living experience can desire. 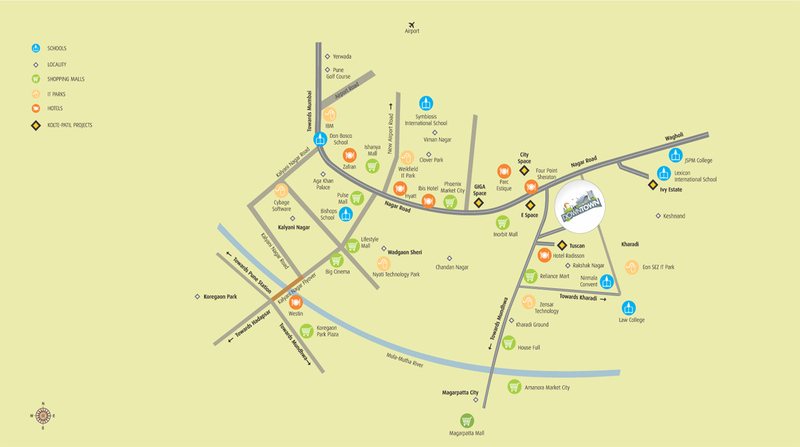 Welcome to Downtown – the face of new-age urban extravaganza at Kharadi, Pune! Kolte Patil Downtown is a marvel that spans acres and acres and acres! Work, live, study, energize and entertain! High-end living, high end work, high-end retail, high end fitness and amenities – all possible only at Kolte Patil Downtown Pune! Let us start with a quick roundup of the living enclaves here. Most homes are in 2 and 3 BHK formats, but are grouped into fine subprojects and clusters. Langston, the aura creating 2 BHK apartments are stylish and smart. The 2 and 3 BHK premium apartments under the title Senona, which means extravagant in Spanish, are really lavish, with only 4 blocks in 4 acres. Cheryl has a variant where 2 and 3 BHK homes and on upper floors with commercial on ground floor. The Beryl, meaning gemstone, are only seven floor high towers with 3 BHK homes, and grand penthouses, four blocks in all! Each cluster has the best of fitness, sports, relaxation, greenery and openness, along with the usual conveniences of security, power and water. Over to the work-zone! The 45 acre City Vista is a wow place to work and own an office. Overlooking greens and modern streets, these are vibrant workspaces in Downtown. The Arissa Avenue is a wonderful superstructure of modern haven to energize business, boutique solutions and successful entrepreneurship. Downtown Cartel is the perfect place to hang out and shop in style, with the international brands! Or a gastronomic delight with cuisines from all over the world! Thoughtful and futuristic, Wisdom Walk is the promise of a better tomorrow. This part hosts top-notch IB and CBSE schools to groom the kids into well-rounded people! Everything at walking distance! Bringing the world to your door! Kolte Patil Downtown Price starts at Rs 65 lacs for the homes and Rs 49 lacs onwards for the commercial spaces! So much to offer, so much to choose from and too much to enjoy!